A baby has been born 15 pounds, 7 ounces - about twice the size of an average baby. The newborn was born in the United Kingdom, and is the second biggest newborn ever born naturally in the U.K.
Baby George King was born just six weeks ago in a dramatic delivery, and since then have been getting rid of all the newborn baby clothes and diapers they had prepared for their son - as they don't fit. Baby George was born completely naturally, which is extremely unusual for a baby of his size, as usually an emergency C-section would be performed due to the likely difficulties involved in a natural delivery of such a large baby. There was no indication that baby George would be this big - both of his parents were born at pretty regular sizes, and are not particularly big themselves. 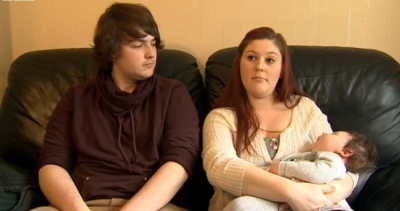 Baby George's size caused significant difficulties for his mother, Jade. Mid-way through the delivery - after baby George's head had already popped out - he became stuck. His relatively giant size for a newborn meant he simply was struggling to get his shoulders out. Mom, Jade, has described that "that's when things got scary," as about 20 medical staff ended up in the room working on freeing the baby. That sparked a big emergency for doctors and midwives, and baby George was oxygen deprived for a full five minutes - with doctors saying that he had only a 10 percent chance of survival at that point. However, he was eventually delivered successfully and was transferred to another hospital for specialist care. He was only allowed home more than four weeks after his birth as he recovered from his ordeal. In the weeks since, he has put on only one more pound, and his parents Jade and Ryan have confirmed that he entirely skipped his newborn clothes and went straight into 4-6 months clothing. He is now going for regular check ups but that everything looks positive.